Aluminium electrolytic and polymer wound aluminium electrolytic capacitors may seem similar at first glance, because their construction and appearance are very similar. However, the technologies offer very different performance characteristics. Adam Chidley, European Product Manager at Avnet Abacus explains. Aluminium electrolytic capacitors are often described as ‘wet’ because the electrolyte is liquid. A typical device would be two pieces of aluminum foil, one coated in an insulating oxide layer, rolled tightly together, with a paper spacer soaked in the electrolyte between the two pieces of foil. The whole assembly is encased in a watertight can to prevent leaking. Although the technology isn’t new, wet electrolytic capacitors are still popular in power electronics for decoupling (especially bulk decoupling) and buffering applications because they are the cheapest option for high capacitance and voltage and can withstand low energy transients. Wet electrolytics come in a wide range of capacitance values, roughly between 10-7,500µF, with many product ranges available from a multitude of manufacturers that specialise in aspects of performance, such as lower equivalent series resistance, high voltage, high ripple, etc. The equivalent series resistance of polymer aluminium capacitors is very low compared to wet types and it’s more stable over a wider range of temperatures and voltages. As an example, ESR is down to 5mΩ for some devices in the Panasonic OS-CON range. This has the knock on effect of better frequency characteristics and resistance to ripple current, compared to wet types, making them ideal for noise reduction over a wide range of frequencies. Furthermore, because the electrolyte isn’t liquid, it doesn’t evaporate, so their lifetimes are improved too. To illustrate, let’s take a closer look at some example devices. A typical 47µF wet aluminium capacitor from the Panasonic FC-V series has a rated voltage of 6.3VDC and the height is 5.4mm with a 5mm diameter. A polymer OS-CON device from the SVPA series with the same capacitance, rated voltage and diameter is slightly higher at 5.9mm. The wet device will last 1,000 hours at 105°C, while the polymer device will last 2,000 hours under the same conditions. The wet device has an ESR of 1.80Ω and can withstand a ripple current of 95mA (rms), while the polymer device's is 30mΩ – a sixth of that of the wet device – and can withstand an impressive 1970mA (rms) ripple current. However, the polymer device suffers on DC leakage current; its leakage is 300µA after 2 minutes. The wet device offers leakage current of 3µA at rated voltage after the same period. As another example, let’s consider a 680µF device from the same Panasonic FC-V series of wet aluminum capacitors. It has a rated voltage of 16VDC, whereas a similar device from the SVPA series of OS-CON polymer wound aluminium capacitors is rated at 4VDC. Both devices are 10mm diameter, but the polymer has a height of 7.9mm compared to 10.2mm for the wet device. 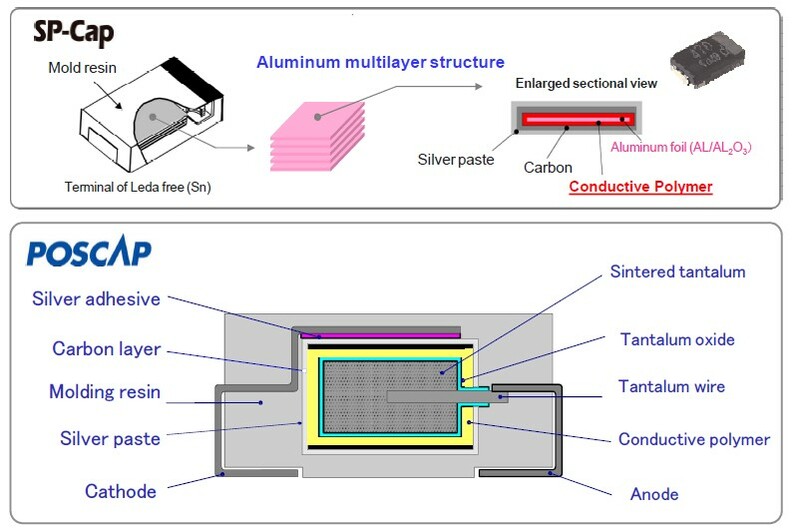 The polymer device wins on ripple current (4130mA (rms) compared to 670mA (rms)), ESR (20mΩ compared to 160mΩ) and lifetime (2000 hours compared to 1000 hours at 105°C). However, the wet device retains its lead in leakage current performance, at only 109µA compared to the polymer capacitor’s 544µA after 2 minutes. In summary, though the devices look similar, the different electrolyte affects ESR, lifetime, ripple and leakage current, and most of the capacitor’s other properties too. Avnet Abacus supplies electrolytic capacitors from a range of manufacturers including KEMET, NIC, Nichicon, Panasonic, Rubycon, TDK (EPCOS), Vishay and Yageo.